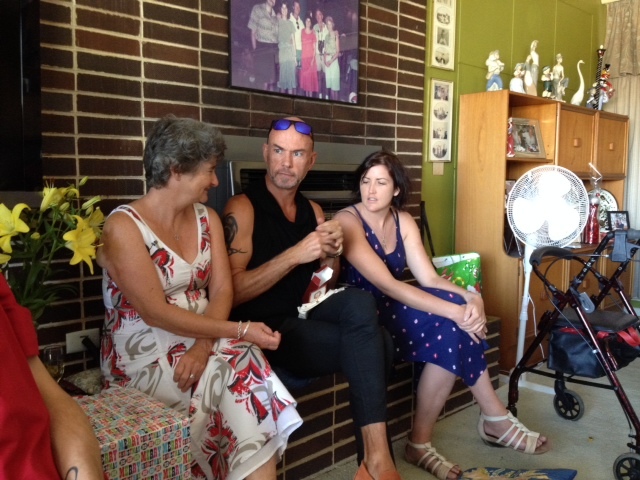 This year it was back to Trevor’s family home for Xmas day celebrations, as for the first time in a few years all of his siblings was here in Perth with their respective partners and it was a chance to once again gather at the family home and enjoy the day together. Even though all the associated grand children and great grand children were not able to all be there it was still a Xmas lunch for 22 and a lovely way to spend Xmas day. I have been an addition to this family for the past 31 years and there are some things that we do the same every time we are together and then there are some new things that we add to the day. This year we decided instead of getting presents for everyone we would for the first time do Kris Kringle and for all the adults attending we would put their names in a hat and then someone in the family would buy them a present to the value of $100. What a breeze this was – this was something that we had done for the last couple of years with the other side of the family – and it really made the Xmas present giving a much more relaxed and fun time as there was not 100 presents under the tree to be given out and you did not have to wait until each present was opened and then to go and thank the family or person who had gotten that present for you. You just said thanks to Kris Kringle and after about half an hour we were done. That is not to take anything away from gift giving at Xmas time. We all like to receive something special and I love that we got one present that was significant and not a heap of things that we do not necessarily need! We were all pretty smart as we got in touch with partners or parents to work out what each person might like as a gift and I think that this is the first time that we all seemed to get presents that everyone seemed really happy with. Well except that my beloved decided that he wanted to play a little trick on me. He asked me what I would like as a present as his brother was in charge of getting the present for me and did not have a clue what to get…I said that I was getting low on either of my favorite after shaves and either one would be a great present. He duly told his brother this but conspired to change things up a bit. I was duly presented my Kris Kringle when it was my turn and straight away thought that the box was a little unfamiliar in terms of the 2 after shaves I had suggested. When I opened the wrapping and found a bottle of Cussons Imperial Leather cologne I tried as hard as I could to look grateful and really happy to be presented with the most awful smelling after shave I have ever smelt. My beloved had a bit of a smirk on his face but I thought that he was just amused that his brother had got the wrong after shave for me. So I sat patiently as I watched the rest of the family ooh and aah over their much wanted and lovely gifts and then low and behold I was given a present that was addressed to both of us and when I opened it, it was a Xmas recovery spa package for 2 people…and then it became clear that a trick had been played on me….mmmmm…much amusement ensued by those perpetrators involved…mainly my beloved who thought it would be funny to see my face at opening a $5 bottle of cologne…but I love the spa package and before I head back to work we will book the time in and head there together. Do l look happy with my aftershave…trying to put on a brave face! With my lovely sister-in-law Lori and gorgeous niece Emily. A big Xmas day at Mum and Dad’s place in Trigg involves a range of different things that we all like and much of it follows tradition that we have done ever since I have been involved and tradition that partners have brought into the family. For me it was my Pavlova – a recipe given to me by a wonderful neighbor were I grew up with my family in Melbourne and which I have handed to others in the family as it really is the easiest and best Pavlova recipe ever…I know I promised to include the recipe in my blog and in the coming days I will post some of the recipes from some of the food that we did on the day for you so stay tuned! For Rita, my brother-in-laws wife, coming from Canada a good Xmas lunch includes a turkey with all the trimmings and roast yams, brussels sprouts and broccoli and peas. 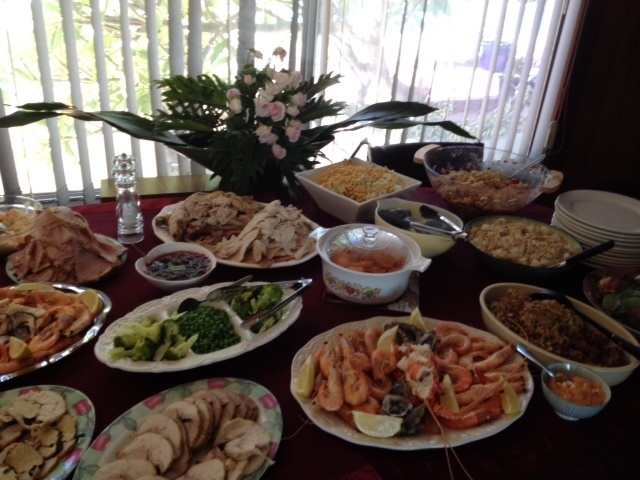 This was a new addition to our Xmas lunches several years ago when Rita joined the family as we had always done seafood, chicken, ham and a range of salads for our main meal of the day. Thank goodness it was not a sweltering day yesterday because I love the turkey, it was cooked to perfection – moist, tasty and served with an amazing stuffing and a great cranberry sauce. Oh and I just love brussels sprouts too…I know a bit of a rarity but ever since I was little I have loved them…mind you there are not many vegetables that I do not love. This was a nice compliment to the fresh oysters, prawns, crayfish and rolled roast chicken and then the salads were all delicious as well. Trevor and I had committed to doing the sweets for the day as that is one of the things that we both love to do and I have a salad recipe that I gave you the recipe for in a earlier blog from Bill Granger that my kids just love and has also become part of our traditional Xmas fare – the mint, pea, pistachio and feta salad. The Xmas table filled with all those things we love on Xmas Day! One of the things about getting older is that you can pass the baton for some of the cooking over to the next generation and this year our gorgeous daughter stepped up to the mark by doing 3 gorgeous salads for the day as well. She created her wonderful potato salad, crunchy noodle salad and to keep her beloved happy a coleslaw. So the tables were set and the food was served and enjoyed by all…of course we all ate too much but I reminded everyone that sweets was still to come so not to get too carried away. Of course we duly pulled the Xmas crackers and duly read out the silly riddles and marveled and the silly gifts included in each Xmas cracker. We sat around at caught up on news. With family spread far and wide over Australia it is not that often that we get the great fortune to really spend any quality time together and it is so lovely to find out what people have been up to face to face and not just in emails and on Facebook. It was then speech time and a chance to give thanks for all being together and remembering those who were not able to be with us and those who we had lost this year. Jeffrey (Trevor’s brother) was eloquent and summed up the day perfectly. 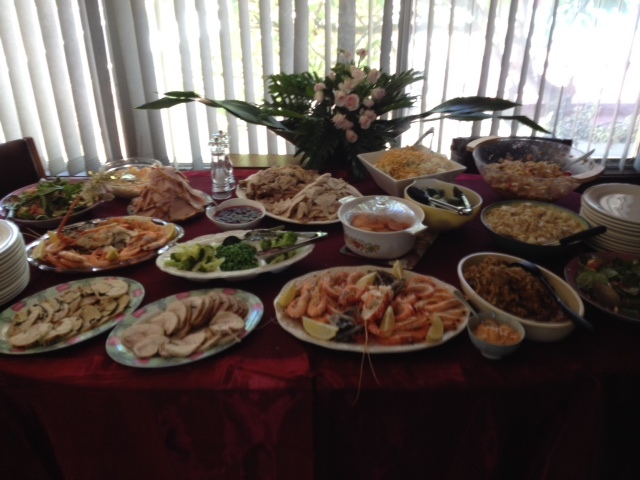 And so it was time to hit the kitchen again and clear up the lunch and get the sweets ready to hit the buffet table. This year we had decided to do a few new things and switch it up a bit. 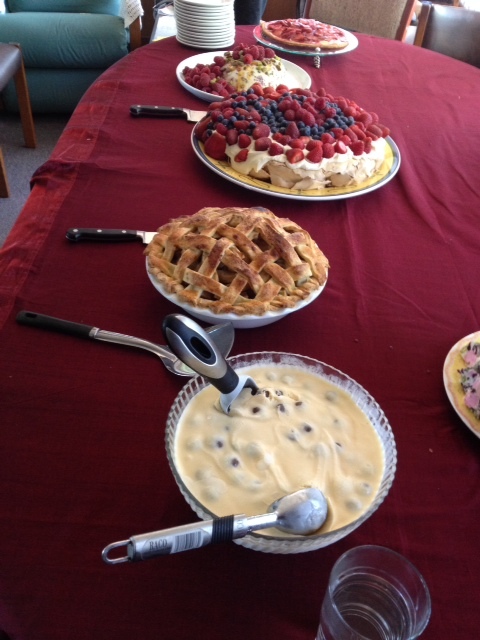 Of course the Pavlova was there but everything else was new and different this year. We make our own ice cream and Trevor decided that one would be a malteeser ice cream and through my Flipboard magazines that I have done lately we had looked at a range of other new and different things to do. He decided on a strawberry and marscapone tart, a raspberry, pistachio and rosewater ice cream and a gouda apple pie…oh and we also made milk and white chocolate rocky road and home fame fruit mince pies to complete the picture. (You will also find the recipe for Paul Hollywood’s Fruit Mince pies in a earlier blog post – they are delicious). 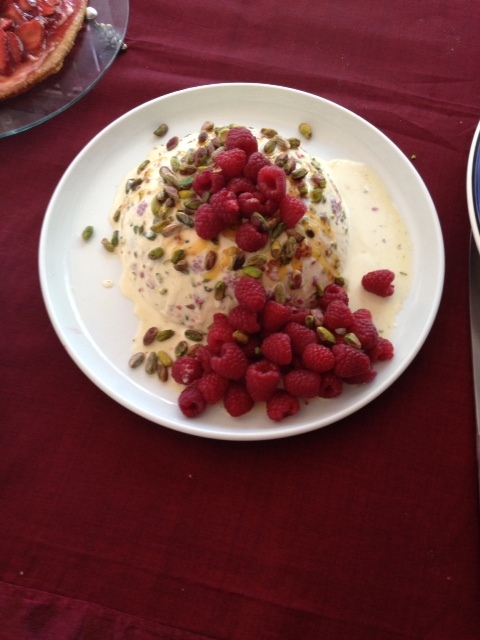 The raspberry, pistachio and rosewater ice cream! 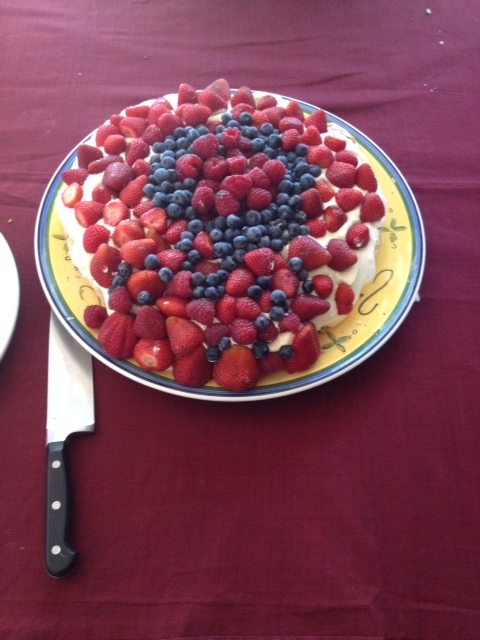 The Pavlova laden with fresh seasonal berries! 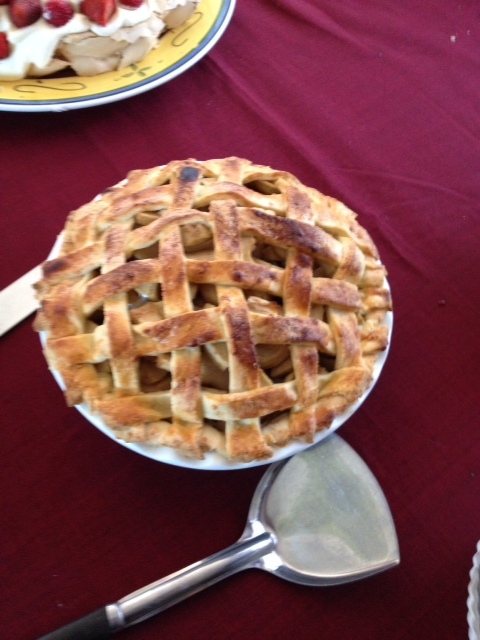 The gouda and apple pie! 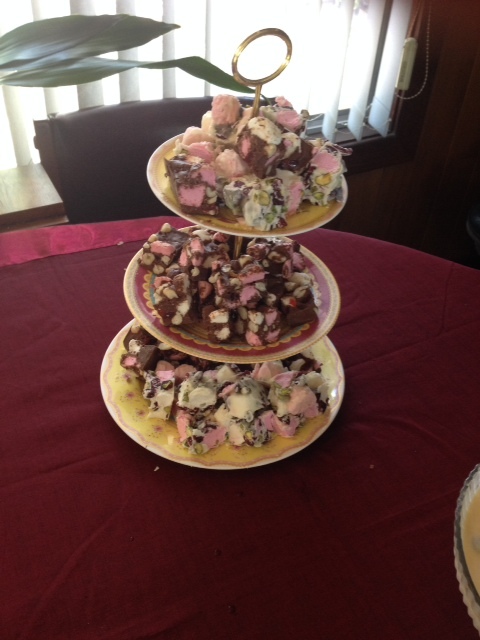 Home made rocky road both milk and white chocolate! The malteeser ice cream and the rest of the sweets on display just before we hit the table! So sweets were duly served and we all indulged some more, going back 2 or 3 times before collapsing on the couch for a bit of a rest before we packed up the tables and chairs to have a little more relaxing before we headed home to set up the new X Box One and just chill for the evening. 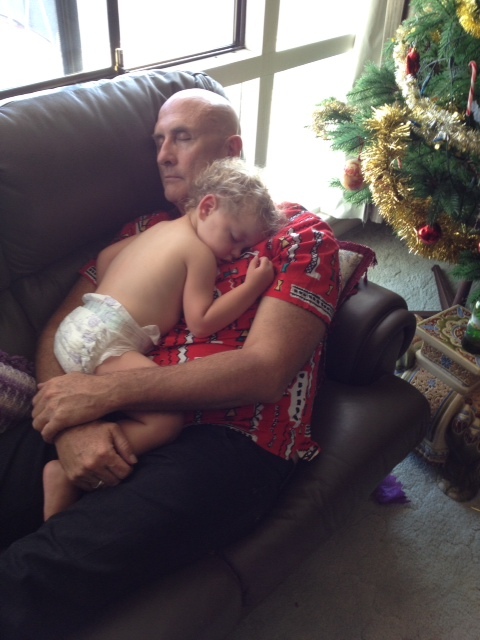 My beloved with our youngest grandson towards the end of the day! And now it is off to get ready to hit the movies for the boxing day releases and decide which film to see before we head up to our daughters tomorrow for the joint birthday gathering for grandson 2 and 3 who turn 3 and 2 a week apart.